There's a tiny bit of work involved in growing peas, but the reward of fresh peas is well worth the effort. You have to start by having the faith and maybe a little bit of courage to go out to the garden on a cold day in mid-March, or whenever it seems like there is just a glimmer of spring in your garden, and sow the seeds. You think it is just too cold and the seeds are going to freeze and rot in the ground but they don't. Soon enough, the pea seeds sprout and the seedlings break through the crust of the ground. You have to watch and protect those seedlings because hungry rabbits will devour them if they find them and can get to them. Then you have to provide some support for the pea vines to climb up. It's really best to put the support in place when you sow the seeds. The peas climb up the support and then soon you see the first blooms, usually white. You know then it won't be much longer when you'll see pods start to form. Then one day you go out to the garden and notice the pods are plumping up a bit and you look them over and find the plumpest pod, just for a taste test. You pick it, carefully break it open, and run your thumb down through the pod to release all the peas into your hand. It's a short trip to your mouth and then you are transported back to your childhood and your dad's garden and remember the peas he grew. You remember sitting on the back patio with him, shelling peas, and talking about whatever. 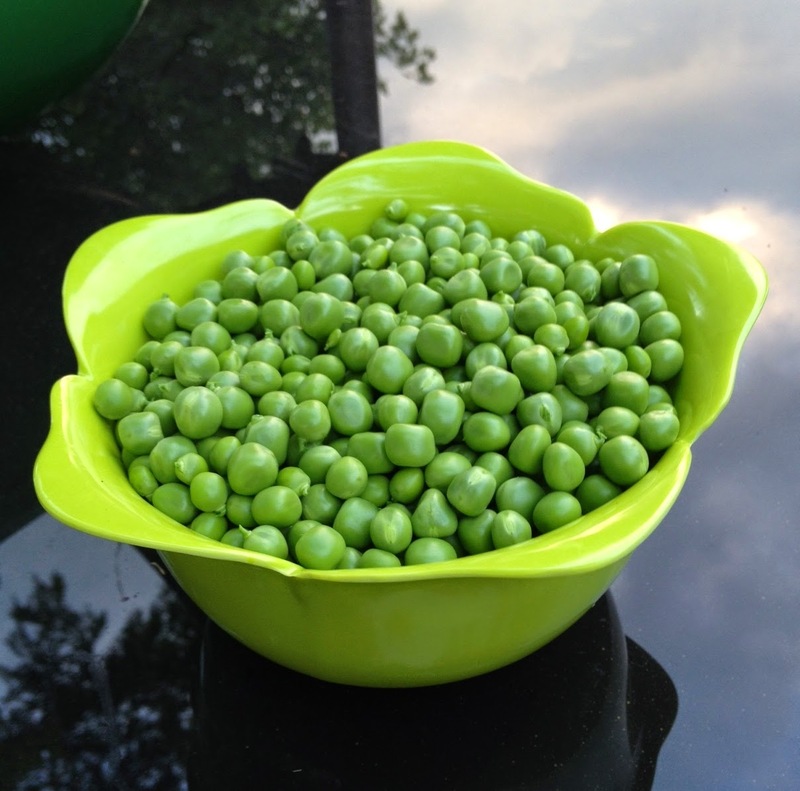 Before long, enough of the pea pods in your garden are ready to be picked, so you pick them and sit down on your own patio, quietly shelling out peas, thinking back to what it must have been like when your dad was a kid on a farm in southern Indiana. They grew peas, enough peas to eat in the spring and then can for eating for the rest of the year. How many rows of peas must they have grown? Many more rows than the 20 foot row in your garden. You think about everyone sitting on the porch of the big white farmhouse, shelling out peas. Your dad, his brothers, later his youngest sister, his parents, his grandparents. You imagine them talking quietly to one another, trading stories, maybe talking about what they were going to do that night, the next day or for the weekend. You hear the wind in the trees and wonder if it still carries with it the echoes of their long ago voices. I don't generally like peas. I never order peas in a restaurant or buy canned or frozen peas.I don't mind peas in vegetable soups but would never eat split pea soup. But I love my fresh grown peas. I love planting them, picking them, shelling them out and eating them fresh. I put them on salads or just eat a few as a snack. I grow the variety 'Green Arrow' because it has more peas per pod and it's the variety my Dad grew. I make sure the bed where I'll plant them is ready in the fall so in the spring, on March 17th in my area, I can sow the seeds after just a light raking of the soil. Technically, the soil temperature needs to be 40 degrees Fahreheit or higher, and it always is by then. By mid-June I am picking peas and enjoying them fresh. I will always plant peas. I also try to plant peas on St Patrick's Day, some years it happens and others not. This year my bed was still frozen on the 17th but I got them planted very soon after. We had our first harvest this week, YUMMY! Thank you for sharing your deepest thoughts.